Gladstone Regional Libraries has six branches (Gladstone, Calliope, Boyne Island, Agnes Water, Miriam Vale, and Mount Larcom) and a Library Out and About service. Click here for more information about the libraries’ resources and facilities. Click here for Contact Us details. The Library Out and About van visits the communities of Nagoorin, Ubobo and Builyan on one Monday per fortnight, and Wartburg, Rosedale and Lowmead on the alternate Monday. The scheduled fortnightly visits and more information can be found here. Gladstone Regional Libraries provide a Home Library Service to residents of Gladstone, Boyne Island, Tannum Sands and Calliope. The Home Library Service caters to the needs of residents who are unable to visit a library due to medical, physical, or other special reasons. Librarians are available to assist you with finding information in the libraries’ collection or online. For further information and some links to reliable websites click here. Gladstone City Library has a Local Collection Room which houses the local history and genealogy collections. The room contains books, reports, newspaper clippings, microfiche and microfilm, and other paraphernalia. More information and links to family history research sites are available here. Bookings to use the reader/printer (for microfiche & microfilm) can be made by phoning 4976 6400. Gladstone Regional Libraries’ branches have collections of fiction and non-fiction books for adults, as well as large print books, magazines, CDs, audio books, and DVDs. All library branches run a variety of events and programs for adults, throughout the year, under the banner of Library Sideshow. The types of events and programs include information sessions, workshops, and entertainment. Library Sideshow provides opportunities for lifelong learning and meeting people in the local community. Click here for more details about programs and collections for adults. 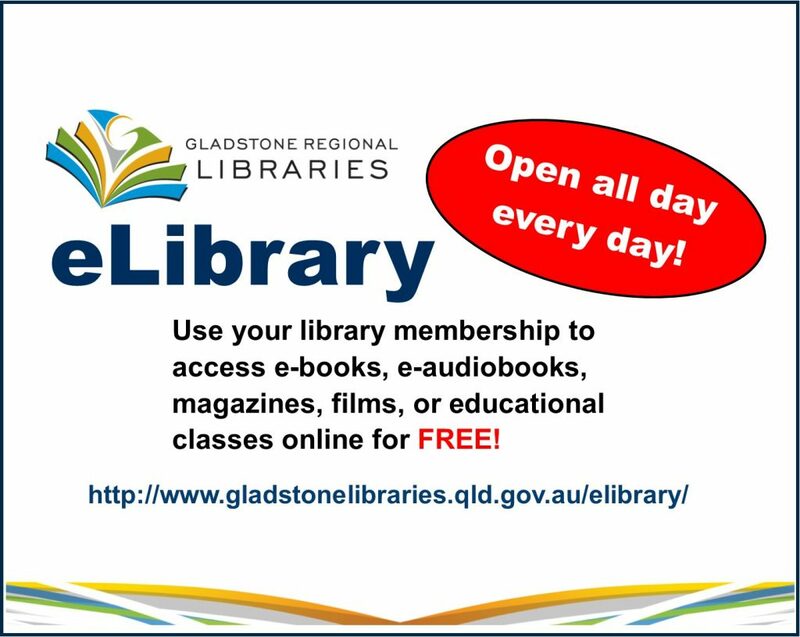 Gladstone Regional Libraries’ branches all have collections of materials for children and young people, click here for more information. The collections include fiction and non fiction books, DVDs, CDs, audio books, and eResources. Most of the branches have toys and puzzles for young children to play with in the libraries. There are iPads for young children to use at Gladstone City Library, as well as an Xbox and Playstation for older children. Board games and similar items are also available to play in the library. Children’s programs are held at each branch and include, school holiday activities, school visits, and regular storytelling sessions.